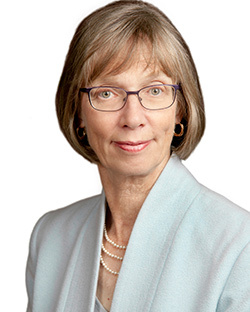 Home › Faculty & Staff › Gilmour, Joan M.
Professor Gilmour joined Osgoode Hall Law School’s faculty in 1990, after practising civil litigation and administrative law. She teaches Health Law, Legal Governance of Health Care, Torts and Disability and the Law in the LLB program. She developed and is Director of Osgoode’s part-time LLM program specializing in Health Law, and teaches graduate courses on Professional Governance, and Legal Frameworks of the Healthcare System. She is past Director of Osgoode’s Institute for Feminist Legal Studies, and past Associate and Acting Director of York University’s Centre for Health Studies. Professor Gilmour’s research and publications in health law span some of the most debated issues in contemporary society. She recently completed a major study on the effects of tort law (negligence) on efforts to improve patient safety and reduce medical error. Current research projects include an examination of legal and ethical issues in decision-making about health care for children, and a study of the interrelationship of disability, gender, law and inequality. She has acted as a consultant to Health Canada, and completed a study for the Ontario Law Reform Commission on assisted suicide, euthanasia, and foregoing life-sustaining treatment. She has also completed studies on health care restructuring and privatization, professional regulation of complementary and alternative medicine, and the interrelation of poverty, health and access to justice. Patient Safety, Medical Error and Tort Law: An International Comparison, Final Report prepared for the Health Policy Research Program, Health Canada (May, 2006). Graduate Research Supervision (LLM): Professor Gilmour is willing to consider supervision in the areas of health law; disability and the law and (some) torts.